← Spring is Coming….So is Coccidiosis! You should be able to file this entry into the “stuff I didn’t know” category. I have had some experience with chicken vision, and was aware of some of the basic ideas of the “weirdness” that bird sight entails. As I started writing this, I wanted to make sure I got my facts right (ish), so looked up a few things, and they led to a few more, and half my evening got lost in obscure eye facts that will never be clinically useful to me, but will be GREAT fodder at the next cocktail party. How do chickens see? What do chickens see? Why do they bob their heads around like that? Why do they look at you sideways? Can they see at night? How much can blind chickens see? then stimulates nerve endings in the retina at the back of the eyeball. A major difference, however is that chickens have tetra-chromatic vision, while we have tri-chromatic. 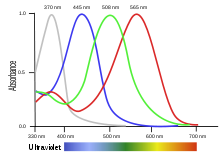 In english, chickens have 4 wavelengths they are sensitive to, while we see 3 (red, green and blue). The chicken eye sees red, green and blue as well, but they are also sensitive to ultraviolet light. This seems kinda interesting at first glance, but the implications are actually staggering. Left: bird and egg the way RGB eyes see them….Center: UV reflection of the same bird and egg….Right: What a chicken sees…. look at the UV contribution, you see something else. The picture on the left is human sight…..the picture in the middle is UV spectrum only, and the right hand picture is a rendering that approximates how another bird would sense that bird. Now….chickens have a disability when compared to us….their night vision is poor. This is a big part of the reason that chickens need protection at night from predators. 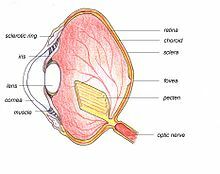 The retina in mammals is made up of rods and cones…..rods to see at night, and cones to see color. Chickens have very few cones, and they are not especially sensitive. This difference between rod to cone ratio, and the light sensitivities of cones in birds vs mammals is explained because mammals all but disappeared from evolution long ago, and the only types of mammals that survived were nocturnal and insect eaters. Mammals that survived this evolutionary bottleneck re-developed colour vision after millions of years, but since we evolved our cones from a different starting point than birds (they evolved from dinosaurs, and never spent millennia as nocturnal creatures), we developed our colour vision a little differently. It’s another case of convergent evolution….kinda like whales and dolphins evolving to look like fish, because that’s the body type that works best in the water. on a bright day….the contrast is enhanced. Now imagine wearing yellow and blue and red goggles all at the same time…..it increases contrast and brightness and sensitivity, all at once, and we mammals can’t even imagine what it might look like. Chickens also have much better motion sensing ability than we do. Not as good as hawks, but better than us….again because of a structure called a double cone in the retina. This is important if you use flourescent lights in your coop. Flourescent lights flicker on and off at a rate above what we can see….you notice it on old flourescent tubes that are dying….the flicker rate slows down and we can see it. It is exceptionally annoying. 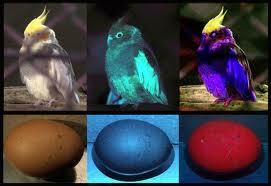 Birds can see the flicker in many flourescent lights, especially dimmable ones that are at lower intensity. It would be like being in a dance club with strobe lights on…..all the time….it drives them nuts…literally. On objects sitting still, chickens may not have as much acuity as we do, however. This explains why hens are as “spooky” as they are when somebody makes a sudden movement, and why one bird jumping from something can cause the entire flock to take wing, even if they didn’t see the offending stimulus. Birds and mammals have a structure called a fovea in their retinas too…..its a small pit that, because of its shape, acts as an image enlarger. You can see yours in action by looking at something out of the corner of your eye, then looking at it directly in front of you…..its way clearer in front of you, and why you look slightly down at anything you are concentrating on (the fovea is a little above the middle of the retina). Chickens have 2 foveas (fovei? ), and they act a little differently. One is for distant vision, and one is for in close….think of built-in bifocals. The funny thing is that the up close one is oval, and sideways….thats why, when you approach a bird, once you get to the focal distance of about 2-4 feet, birds will often bob their heads, and tilt their heads somewhat sideways to get the image better lined up on the second fovea. Birds actually can’t reliably recognize flock mates until they are within about 24 inches. Finally, blind birds can see light. Birds reproductive cycles are controlled by their pineal gland, which is located in the middle of the bird’s forehead, just under the skull. The skull is thin enough that reasonably bright light penetrates it and will still stimulate the hormone cascade that begins lay. Even blind chickens can “see” spring coming. This post is way too long already, so I will cut it off here….just remember, even if you and your chickens can see eye-to-eye, you still won’t see what they see…..keep it in mind when you try to figure out why they do what they do. This entry was posted in Backyard Flocks - General Info and tagged backyard chickens, chicken, eggs, everything eggs, laying hens, poultry, vet, veterinarian. Bookmark the permalink. Wow! Such interesting information. I knew about the flicker frequency issue as I had read something on that. I hadn’t come across the UV sensitivity difference explained so clearly before. I have lights in breeding pens and read up on the flicker frequency problem. Although I was aware of the potential stress I have left the fluoro globes in there but they don’t appear to be worried by them at all. They come on an hour before dark and then extend the day for a few hours and then go off. No ill effects. When I bring a sick bird into the house though, I now ensure I cover the box or use a different globe in that room. Fascinating! Great info, Dr. Mike. Can’t wait until the next cocktail party! Wow. This is such a great post. I’ll never look at my birds that same way again. Thanks for sharing your research! Got a question for you (and any other readers). Right now I am putting horse bedding (wood chips), in the hen house as the floor (on top of the wood). When they poo on the bedding, I take it out and put new bedding in. I usually clean it twice weekly. Do I need to put the bedding down on top of the wood floor? It causes me to have a lot of work when cleaning the coop. It is a hassle. Does the bedding help the chicken’s feet or something? What is the bedding doing for them? PS. Had tons of eggs in Asia. The eggs were a lot more orange. Wonder what they feed their hens! Wow…thanks Daisy. I really appreciate the support! I have been a little slow with posts lately, with end of the semester coming, and other things busy at work, but I expect to get back in the swing soon!!! I am in fact glad to glance at this blog posts which consists of tons of valuable information, thanks for providing these kinds of statistics. Are there any tricks to rasing prime time show chickens? We have an lFFA project going here in Texas. Lots of family fun watching after my grandson watching after his 50 broilers. Hi Judy….I don’t have a lot of personal experience with show chickens, but I did an interview with a judge with 40+ years experience. He kept coming back to the phrase “breed standard”. He said he could like a chicken just fine, but if she didn’t meet breed standard, he had to mark her down. So, from that, I would find out what the standards are for the IFFA project, and find the chickens that are closest to this. See if there is any trimming or barbering recommended, and do your best to get the right height, comb shape, weight, and anything else thay ask for. My 2 year old cochin rooster had beautiful orange eyes. today I noticed that one eye was grey and maybe a little cloudy. Any idea what could cause this. We have been battling bumble foot for almost a year and today I noticed a significant limp. I soaked in epsom salts and warm water and bandaged foot after applying vetericyn. I would take a close look at the condition of the bedding in your coop. Moist bedding will cause breakdown of the keratin layer of the foot, allowing bumblefoot to occur over and over. Moist litter will also allow more ammonia to come off the manure, causing “eye-burn”, which sounds like what is going on with his eye. Clean out the coop regularly, and make sure that the coop is well ventilated, which can be a challenge in the winter. My neighbor has some “girls” that come and visit me and I was just looking for some info on them. Great post and websight. can chickens see black color ? wil I have any problem if I feed them with black color shell grit. as calcium supplement .??? wil they eat them ??? Absolutely, chickens can see black. You should have no problems. Thank you for the info. I saw last night my chicken couldn’t come down the stairs in the dark and needed to understand what was happening. This article helped me with understanding their night vision is bad. I have nothing to do with chickens at all and I still found this enormously interesting. One question: do chickens see forward, like predators usually do, or to each side, as their eyes are on the sides of their heads? I saw red chicken goggles so this intrigued me. Chickens do see forward, and have an area of bifocal vision which gives them good depth perception (they ARE predators, and they also need to judge distance well for flying and landing….although they don’t seem to be especially adept at these tasks). They also have a wide field of vision, due to the lateral placement of the eyes….they can’t see as wide an angle as say, a horse (who can see 330 degrees), but it is extensive. There is a strain of chickens that are naturally blind due to hereditary retinal degeneration. These chickens start reproduction earlier and produce more eggs per cycle than their sighted counterparts. In addition, these blind birds are less aggressive and less stressed from human interaction. By all measures, the animal welfare of these blind birds are higher than their sighted counterparts. Given this fact, is it ethically appropriate to shift over to all blind chickens as a solution to our animal welfare problems that are associated with commercial egg production? Is this permissible on animal welfare grounds? Why or Why not? Great job with the blog and research it entailed 🙂 I find chickens to be more and more fascinating the more I learn about them. I don’t think anyone puts any thought into the life behind that nicely packaged (and tasty) meat in the grocery store. Most of my friends sure haven’t, before they met my girls of course! I’ll thank my sister for sharing this on my Facebook and will follow you! I think more and more people are thinking about where there food comes from. I also think that everything is more interesting, the more you learn about it. Bees, worms, termites, geology and fungi are endlessly fascinating when you actually start looking into them. Chickens are quirky, and have a strange social structure that few people appreciate. They are simultaneously gentle and vicious, nurturing and cruel. The more we understand why they do what they do, the better we will be able to care for them, and the more interesting they will become! Thanks for following the blog. This is a fascinating post and helps me answer my daughter’s questions. Thank you. Excellent article, Dr. Mike…thanks for the information. BTW…The Chicken Chick sent me! Any chance you want to become a chicken/goat vet? We could really use someone like you in the goat world. You do NOT want me as a goat vet. I was a large animal vet for 2 years before I started with chickens….I am a GOOD horse vet, a reasonable cow vet, and small ruminants, well, lets just say they threw me a party when I took the new job….plus, I am a pretty big guy, and helping with kiddings is not very pleasant for the poor mommas…. wow a very interesting article good facts in easy to understand english, thanks chicken vet! 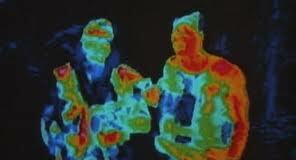 i was very surprised about the uv blub info and knowing how they may see me, goodness we must b scary! This article was so very interesting. I have cockatiels and a galah cockatoo- who is my big baby. On the downside of the article,I am so so so depressed now,seeing what they see,how they see me. I looks like something out of a movie, terminator? Preditor? I thought they saw me as see them. It was just a natural thought . I cannot fathom them feeling comforted by me or anything else ,as they look at the world thru their vision. The example picture I looked at upset me very much.I could cry. Thank you for the highly informative column though. Debbie….don’t worry at all about how you look to your birds. Remember, they were born (hatched?) this way, and they’ve always seen the world through this filter. They see colours that we can’t even imagine, and see details that are totally beyond us. They don’t actually see you the way the picture shows….that is just an approximation to try to give you an idea….they see much, much more than that, but they are used to it….if they saw you through your eyes, they would feel half blind. I hope this sets your mind at ease a little. Hi, neat article, will definitely understand a little more about the girls – now the ducks, I dunno yet. All of the birds seem to see tomato pieces and run for them, the cukes and zukes, not so much. I notice that the chickens sort of rub their heads side to side around the area where the tomato pieces were on the ground, I guess looking or feeling for more. I assume they have a good sense of smell. Florescent and LED lights make me crazy enough, I dislike them and don’t understand why they are used in offices, schools, department stores and supermarkets. I thlnk that’s why kids often misbehave in that environment and office workers gets so tired mid-afternoon. The lights are exhausting. Thanks for the info. This is such an amazing article! Thank you!! I had to re-read it as I realized I was a bit mixed up on which light bulbs affected them. One question I have is if LED lights are the same as fluorescent lights? We have found a non-breakable LED light bulb that we put in my son’s lamp next to his bed, and were thinking those might be better to use around the girls, but not if they’re going to cause harm. Again, thank you so much for this great article! No, LED lights are different from Flourescent lights. Flourescent lights have an on/off cycle that you can see when they get old, and it is what makes them buzz when they don’t fit right. This cycle can be seen by birds, due to their higher speed of processing vision. LED lights just glow….kinda like a candle….the light comes constantly and doesn’t cause the same problems as fluorescent lights. Many professional barns are using LEDs, with great success. Please be careful with the non breakable kinds of lights. They have teflon coating, and when that heats, the fumes are toxic for chickens. Hi, Dr. Mike. I was fascinated by your article, and it was very informative, but I still have a question: According to what I read, it would appear that chickens can only see a vague outline (compared to what humans see) that seems more like a thermal imaging photo, however, when it comes to even the tiniest crumb dropped on the ground, they seem to have laser-sharp vision? Could it be that they have a more acute sense of smell than we do, and they are actually smelling the food, as opposed to seeing it? Sorry I wasn’t clearer……chickens, like most birds have very good visual acuity, and probably see clearer than we do….the examples were very rough approximations of what they might see. Chickens are extremely visual, and have weak smell and taste sensations….without a doubt, they find the crumbs and tidbits by sight. I think it would make a great project, and I think it’s fascinating when people with different backgrounds look at the same problem…..your knowledge of the physics of different light technologies will make for an interesting angle on the discussion. I should have asked if I could reblog your article before doing so. Consequently, I deleted it from my WordPress blog. May I post a link to your post on chicken vision on my blog? Awesome! Thank you so much. Your article rocks. Thanks for the support Rafael! The only comment I have on your post is that chickens that lay eggs need a balanced ration, not just table scraps and whatever they can scrounge. Not feeding the proper feed will cause illness and even death. Otherwise, it’s a great start! Thanks for your wonderful article about how a chicken sees. I’m new to chicken ownership and am amazed that my hens are such fabulous huntresses. While weeding in the garden today, they were able to pick out every worm I found and more. Gotta love science! I found this article fascinating and illuminating (ha ha! pun! ), and it ticks all the boxes we needed to know about, save one: the matter of LEDs. LEDs are safer than Incandescent (primarily plastic instead of breakable glass), have much longer lifespans than Incandesecent (years instead of weeks / months), enjoy energy savings (actual wattage used) that do manifest in lower overhead and power bills, put out less heat, and do not have the strobing / flickering effect that plague fluorescents. One of their most notable characteristics is that, because they are a product of the solid state (computer circuitry) age, their emitted light output is rather controllable. LEDs are being sold able to emit color-temperatures of 2700ºK (Warm White), 3000-3200ºK (Soft White… sometimes marketed as Warm White), 3300-3350ºK (Studio White), 4000-4100ºK (Natural White, aka Moonlight), 5000ºK (Cool White, where most CFLs exist), and 6000ºK (Pure White, aka Daylight). Nearly all Incandescents are 2700ºK (specialty bulbs, such as the GE Reveals, achieve ~6000ºK daylight by using coated, filtered glass), while nearly all Fluorescents are 5000ºK. The incredible benefit to this defined construction of LEDs is that they do not produce any additional wavelengths of light – meaning they do not produce (or they produce extremely minimal amounts of) IR or UV. And your expertise points out that chickens need UV to see properly. What would your advice be? What got me onto this topic is our attempt to prolong the light in the coops, and with the ability for LEDs to recreate daylight’s 6000ºK characteristic, I thought I found the holy grail (or at least something really really close to it). Are LEDs going to be a true benefit, or should I supplement their use with UV light bulbs? I believe that even normal LED’s are a good source of light for hens, and the fact that the light spectrum isn’t perfect doesn’t mean it is a step backwards….LED lights are still a better source than Compact Flourescents, or 2800 degree incandescents. I would say go for the LED’s, and if possible, find a source of Poultry Specific LED lights. Hello, where do you have this pictures from? And all the literature? The pictures are from all over the internet, and the information is from an animal behavior course I took, as well as several readings I have done on the subject. I’m wondering if anyone can offer some help. We have a Dixie Rainbow chick who will be 7 weeks old on Thursday. She’s a rather large girl, at least as big or maybe a little bigger than our 8 week old Buffs. My husband thinks that she may either be a little “slow” or perhaps have some sort of vision problem. He says he has held food in his hand to her, and sometimes she will sort of tilt her head sideways as if to look with one eye. She likes to lay down a lot to eat. And in the evenings when it’s time for them to go into their house, she is always the last one. It seems like she has trouble finding where she needs to go up the ramp leading to the door. She has done it on her own once, maybe twice. Last night she almost did it, she started up the ramp, then jumped down. So as all the others went into the house, she was under the ramp at the door, looking up at the house. It’s like she knew where the other girls were but couldn’t figure out how to get there. She makes this lonely sounding chirping noise as if she is calling out to them. Once we pick her up and put her at the start of the ramp, she seems to find her way with no problems. She also has trouble walking down the ramp in the mornings, it’s almost as if her feet are too big, so it’s awkward for her to walk. She won’t jump up to any of the tree stumps or roosting sticks we have in the run, and I think it’s because she’s too heavy she can’t jump. I’ve read some say this breed is lazy, and i’ve also read that they do like to lay down and eat sometimes. I’ve held food in my hand for her and I have not noticed her having any trouble finding it. She eats and drinks with no issues, and seems to know where things are. Hi Brenda It does sound like she has either vision or possibly neurological problems, with her inability to climb, fly or land well. Unfortunately, I can’t think of any common condition that would cause this. I would suggest taking her to a small animal vet who could investigate the problem. Sorry I can’t be more help. At what stage can a chicken see (at what stage does vision develop) and at what stage do the hearing develop?. Do you have any references for more reading on these matters? Chickens hatch with the ability to see. They probably can see before birth, but I’m not sure how long pre-hatch they get that ability. Chicks can chirp about 2 days before they hatch, and seem to respond to sounds from the hen around this time. As for references, I get a lot of information in bits and pieces from animal behaviour papers, but don’t know of any good, overarching resource, sorry. I usually don’t comment but I had to. This post is incredible and has all the information for a science project. Thank you.